If you pay for your parking at Luton airport on the day without pre-booking you can end up getting stung with a heavy price tag. Never fear, by booking cheap Luton airport parking with HolidayExtras.com® you can get a much better deal. Our prices start from an amazing £39.99 for eight days parking. If you book your Luton airport parking in advance through us, you'll get exactly the same service as if you hadn't booked but for a much lower price, in some cases we can save you up to a massive 60%. You can be confident that Holiday Extras prices will never be beaten and in the unlikely event you find the same product for less somewhere else, we will match the price, guaranteed. See our Never Beaten on Price guarantee page for details. Theres no need to worry about your pride and joy while you work on your tan. All our Luton airport car parks are fully secured and hold the Park Mark®, a national security award accredited by the Association of Chief Police Officers. They are all regularly patrolled and protected by entry and exit barriers, fencing and lighting. So your car will be safe until you return. 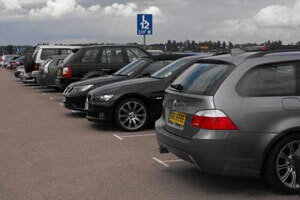 Airparks Luton is almost always our best value Luton airport car park. It's just a 12 minute transfer from the airport, and buses run every 20 minutes, 24 hours a day. So youll always be able to get to the airport quickly and easily. Whats more your car is parked for you to save you time. Luton Long Stay is another great value car park and is the best choice if youre pressed for time. 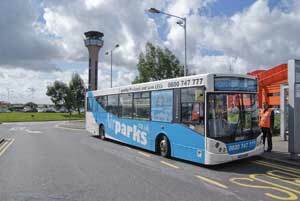 It's within the airport grounds - transfers take 10 minutes and run every 10 to 15 minutes, 24 hours a day. For even better value we offer a special supersaver rate at Luton Long Stay. This is cheaper than our normal rate - but remember once you've made your booking, you can't change or cancel it. To make your life even easier, we offer a host of handy upgrades which can be booked together with your Luton airport parking. Well sort out your holiday insurance and currency, as well as give you traffic updates by text on the day you travel. We can even get you straight to the front of the airport security queue if you want to avoid the crowds. If you're an Airparks customer, you can treat your car to a valeting so its beautifully clean upon your return. We can also have it brought to the terminal when you land so you can drive home straightaway.